If you know me, you know that Disneyland is HOME. I feel more at peace on Main Street in Disneyland than in my own town. Some of my favorite memories are those where you can feel Walt right there with you. My favorite thing to do is walk down Main Street right at opening. Especially when it’s not a busy day. I love to just walk slowly down Main Street taking in the gorgeous day, listening to the families around me plan out their day. I love seeing first timers seeing the castle for the first time, hearing the excitement in their voice when they see Mickey and Minnie greeting guests. I like to not rush, so I keep to the side allowing those who want to hurry and get to Space Mountain to run past. I always imagine what it would be like to walk down the street with Walt. he must have some great stories to share. At night right before closing, I like to get an ice cream cone from Main Street and sit on the benches that are on the bridge of the castle and just relax. Sometimes if it’s really calm you can hear Snow White singing by her wishing well. It’s so serene. Parents are pushing the little ones who fell asleep in their strollers. They are clutching to their little Mickey plushes while they dream about the exciting day they had. I absolutely love this time in the park. And it’s one of those moments that you just feel Walt with you. In California Adventures we have a tradition of getting a frozen lemonade and sitting in The Art of Animation and watch the film clips over and over until our lemonade is gone. Usually we can sit in there for hours and hours. I love watching the different Disney movie clips and watching how Disney movies have progressed over the years! Sometimes it can get a little busy, but I still find it really relaxing! Now I’m all for the excitement that Disneyland brings. I love the crazy rollercoasters and usually I’m pretty hyper in the parks, but I love the calm and quiet moments that people don’t usually experience in the parks. I consider these places my happy place! And if you find yourself in the park soon, I hope you can have some of these experiences as well, it’s a great break from all the hustle and bustle! Do you have a spot in any of the parks that is where you can just feel calm and peaceful? Have you had any moments in the parks where you could just feel like you were walking with Walt? 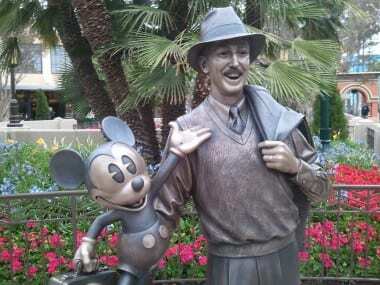 If you could walk with Walt in the parks what rides would you want to ride with him or what questions would ask him? Arielle Boardman loves writing, Disney and writing about Disney. It is her dream to spend her days writing about the mouse while laying on the beach and enjoying a dole whip. Until then she’ll scrape the ice and snow off of her windshield and work in marketing and sales coordinating. At least she has the woodland animals to help clean her house.